As little as 100 years ago, the Alpine areas of Austria (mostly Vorarlberg, Tyrol, Salzburg and parts of Upper Austria and Styria) were among the poorest and most underdeveloped in all of the German-speaking parts of the Empire. Today, these areas are among the wealthiest with excellent infrastructure, a high standard of living and a booming economy. What happened? Skiing was invented. That′s all. Peasants and farmers in the Alpine regions of Austria had been using boards and poles to slide down the mountains for a long time (winters in the Alps are long and there is little else to do), and by around 1900, proper skis were already used. They were naturally very coarse and simple and it took quite a bit of skills (alongside with a pole) to use them without breaking your neck - but they were skis, nonetheless. Around this time, skiing clubs were formed mostly in Tyrol. The railway system had been extended in the decades of a booming imperial economy and aristocrats from Vienna discovered the Alps as a playground. In 1907, the owner of the Gasthof Post, a small inn and guesthouse in St Anton, recognised the potential of a possible skiing industry. This man, Carl Schuler, turned from a provincial landlord to a hotel owner with a mission: To create skiing tourism in Tyrol. For that purpose, he hired a 17-year-old cheese maker as a ski instructor. Today, you have to pass a rigorous examination to qualify as a ski instructor, but back in those days, anyone could do the job. The name of the young man was Hannes Schneider. According to legend, Hannes had been blessed with a sportive spirit since his early childhood days and loved to ski and teach skiing even before he became a "professional" ski instructor in 1907. I wouldn′t put too much trust in these legends, though, as Hannes Schneider is generally glorified in Austria today. Anyway, during the seven years between 1907 and 1914, Hannes Schneider contributed to Tyrol′s efforts to promote skiing as a sport and developed a "scholarly" tradition on methods for ski instruction. Basically, he made skiing safer, introducing styles and manoeuvres such as the "Schneepflug" (snowplough) and parallel turns. 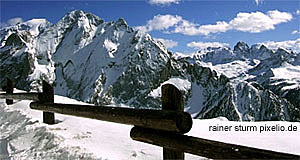 In these years, the base for St Anton′s reputation as Austria′s skiing capital was created. With the outbreak of World War I, Hannes Schneider enrolled with the "Imperial and Royal Army" and started to teach skiing techniques to soldiers. Even today many Austrians are very proud of the "Gebirgsjäger" ("mountain rifles"), a unit trained for battle in Alpine terrain even at very high altitudes and in deep snow. Armies from all over the World, including the US and China, send soldiers to Austria every year to train with the Gebirgsjäger. When Hannes Schneider started to teach skiing to soldiers, this was a novelty, but proved to be highly efficient. His units were in combat on the Russian front and later against Italy. When the war (and the Empire) ended in 1918, Hannes Schneider went back to St Anton. Continue with "Hannes Schneider - Part II"